James Young Simpson (1811–1870), the young professor of midwifery at the University of Edinburgh, became chairman of that department at age 28. He discovered the anesthetic properties of chloroform on the evening of November 4, 1847, while inhaling it with two colleagues and some family members in his dining room at 42 Queen Street, Edinburgh. 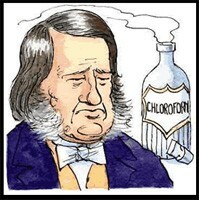 Four days later he administered chloroform for a few minor operations, and the next day, November 9, he performed the first delivery under chloroform. He reported the details of the event at the November 10 meeting of the Edinburgh Medico-Surgical Society and a few days later in two medical journals. The patient was an anxious young woman who had barely slept the two previous nights. Her first baby had been delivered by craniotomy after a three-day labor. She went into labor for the second child two weeks before her due date. Three and a half hours after the onset of her contractions, Simpson poured half a teaspoon of chloroform on a handkerchief rolled into a funnel and repeated that dose 10 to 12 minutes later. Twenty-five minutes after the onset of anesthesia, the unconscious mother delivered a healthy baby. When she awoke, she initially did not believe that she had given birth.